Back in May, my blog entry Love Hurts told the quick story of a Storm-like email message that tried to lure victims to a site that automatically downloaded an executable Windows program. A month later, a new wave of such messages started flowing, but the destination at the end of the email links is far more insidious. Ugh. I'm getting that bad taste one gets from having eaten one-too-many of those chalky candy hearts with ooey-gooey phrases on them. "I Wuv You." Message bodies are a continuation of the one-sentence theme employed by not only a lot of recent malware lures, but recent medz and knockoff brand-name goods spammers who use the same address lists. I'd repeat some of the message bodies here, but reciting too many lines in the spirit of "Missing you with every breath" will make me vomit. What these messages want you to do is visit the URLs at the end of the sickly sweet lines. Some email clients turn anything they recognize as a URL into a clickable link, unfortunately making it easier to go in search of your untrue love. The URLs are to a bunch of plain-language .com domain names, such as makinglovedirect.com (now suspended the last time I checked). 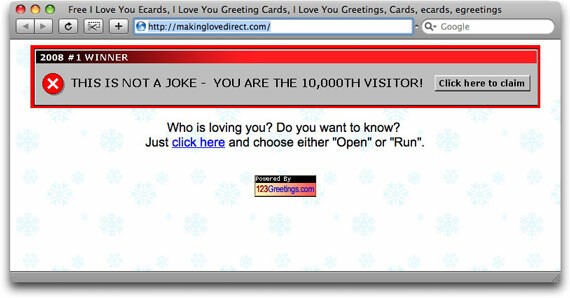 No, I really wasn't the lucky 10,000th visitor. Everyone is the lucky 10,000th visitor. Just as I've written that the assertion "this is not spam" means that it's spam, the assertion that "this is not a joke" means that it's a joke. Almost all of us want to be wanted and loved. Malware distributors exploit that desire by making us believe we have secret admirers and might even get lucky with the right connection. With this malware campaign, you won't get laid, but you might well be screwed.